This will be a bit of a quick review but I wanted to let you know what I thought about both Race and Risen. I feel they are both better than their RT scores might lead you to believe. I grouped these films together because I feel they have the same strengths and weaknesses. 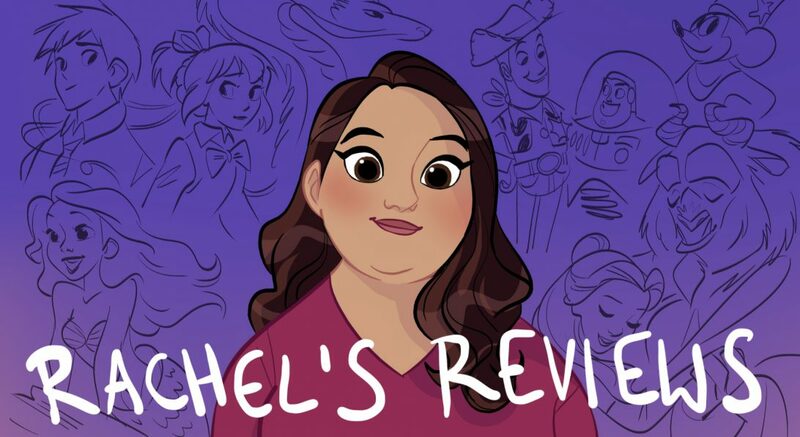 If you are someone who requires super original stories than Race and Risen might not be for you. But if you can appreciate a solid genre film outing than I think there are things to like in both films. 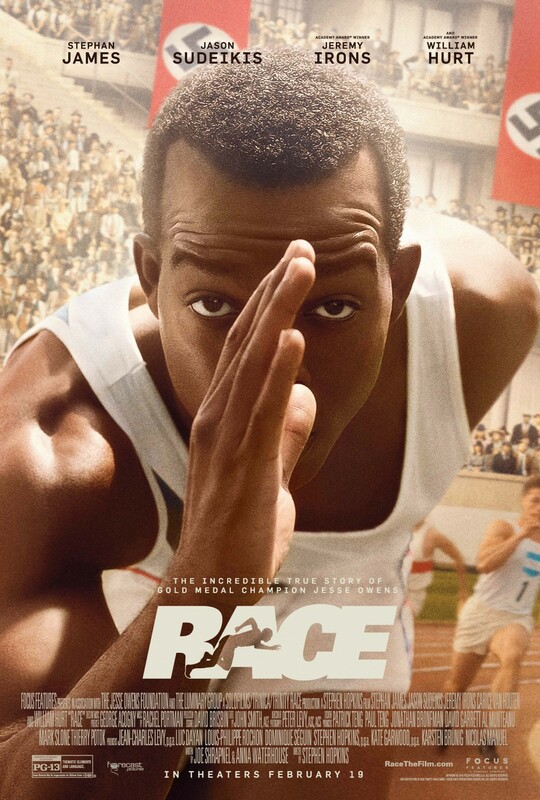 Race tells the story of Jesse Owen’s and his journey to the 1936 Olympics in Berlin, Germany. This was the time the Nazi’s were using the Olympics as a PR stunt and the movie does a good job showing that dynamic and the debate the US Olympic Committee had in attending the games. I also did not know about the pressure put on Jesse and other athletes to individually boycott the games. Stephan James is great as Owens and I really liked Jason Sudeikis as his coach Larry Snyder. It feels a little drawn out and could have started sooner to get things moving close (over 2 hours is too much for this kind of story). That said, I thought they got the period details right and Sudeikis embodies a Clark Gable type charisma that fits the era very well. There are too many subplots but the acting from Jeremy Irons, William Hurt and others is great. Overall, it’s an inspiring story that’s pretty well told. I think you would enjoy going with your family. There wasn’t much that is offensive and it could start a good discussion about race, discrimination both in the past and in our current society. 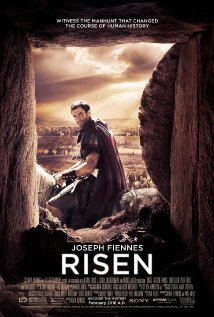 Risen is a very unique and strong entry in the faith-based film genre. It stars Joseph Fiennes as Clavius who is a Roman Tribune who is responsible for looking into the lost body of Jesus Christ. It kind of becomes a CSI Jerusalem at a certain point! There were a lot of refreshing choices they made in this film. First of all, to tell the story from the perspective of a non-believer was compelling and interesting for a faith-based film. They also take the subject seriously without much preaching. It’s just the story without the dogma of some religious films. It’s very well made and acted. I liked the cinematography and overall feel of the film. It’s actually pretty gruesome for a faith-based film; although, I don’t think anything too bad. There were a few points that were a bit repetitive in feel but overall the 107 minutes goes by pretty briskly. The performance by Fiennes is good and his journey feels authentic and subtle. There are some problems. I didn’t like the portrayal of the apostles as kind of ‘Jesus and his Merry Men’. They were a little too silly for my taste. I also didn’t like the portrayal of Mary Magdalene. As the only female presence in the film I felt the transformation I see in her in the scriptures should have been more accurately shown. But overall it’s a solid entertaining film. It doesn’t preach too much and has a good story. I think Christian viewers will really like it and I hope it does well. It’s certainly a step in the right direction for faith-based films. Here is my youtube review of Race and Risen. I’d be really grateful if you checked it out and gave it a thumbs up if you like it. In ‘Risen’, does Jesus appear as a character, or does the entire movie take place when the Romans are searching for his body? Yes Clavius meets Jesus in the 3rd act. Pingback: Eddie the Eagle Review | Reviewing All 54 Disney Animated Films And More!